Go From Being a Comic Book, Anime or Superhero Fan to a Cosplayer! CORPUS CHRISTI, TX – The Corpus Christi Parks & Recreation Department is excited to announce its first ever “Mr. J’s Cosplay Academy” for ages 10 and older. Learn from a trained and experienced professional about how to build your own cosplay costume, perform and market yourself to become a professional cosplayer. It will be fun and exciting! Professional instruction will be provided by John Pantoja who is the Corpus Christi Joker. Mr. Pantoja has been a professional cosplayer for many years and has competed and won many cosplay contests during his career. 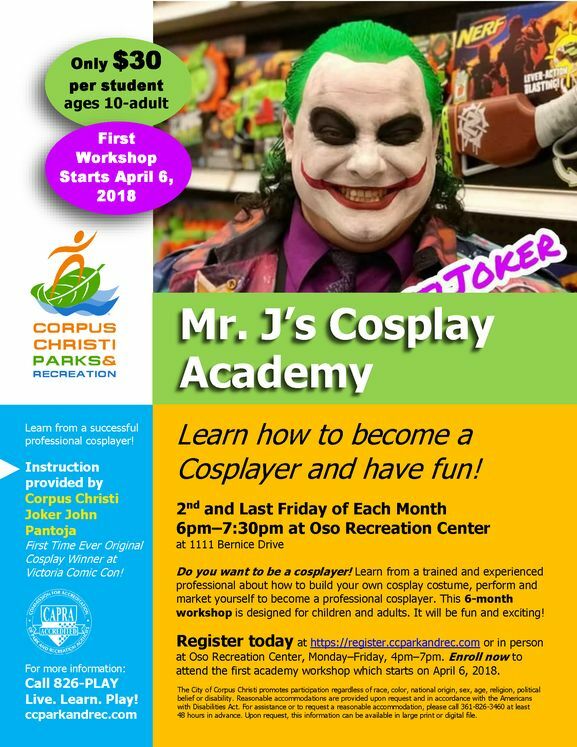 Enroll now with the Mr. J’s Cosplay Academy to become a professional cosplayer! Mr. J’s Cosplay Academy is a six-month workshop with progressive sessions on different topics presented each month. The workshop will begin on Friday, April 6, 2018. Children must be accompanied by an adult to attend. The registration fee is $30 per month per person. For more information, call (361) 826-3485 or visit www.ccparkandrec.com (click ‘Recreation Centers’). The Corpus Christi Parks & Recreation Department is dedicated to providing quality, affordable enrichment programs for all ages and interests. For more information about the wide variety of programs and services offered by the department, visit www.ccparkandrec.com. We invite everyone to Live. Learn. Play!